Latest Perfect Balance leotards and gymnastics wear styles for women and kids. Perfect Balance Girls Gymnastics Glitter Print Tank Leotard G721C: Always shine brilliantly with Perfect Balance gymnastics pieces. Leotard features tank straps and an allover holographic twinkle print. Perfect Balance Girls Gymnastics Glitter Print Strappy Back Tank Leotard G720C: Always shine brilliantly with Perfect Balance gymnastics pieces. This glowing leotard features tank straps, a strappy back, and an allover holographic twinkle print. Perfect Balance Girls Gymnastics Patriotic Print Shorts G688C: Be an American dream with this shimmering patriotic print by Perfect Balance. Be a star in these glimmering shorts - featuring a contrast waistband, and contrast side panels. Browse the entire collection for other mix-and-match pieces! Perfect Balance Womens Gymnastics Patriotic Print Shorts G688: Be an American dream with this shimmering patriotic print by Perfect Balance. Be a star in these glimmering shorts - featuring a contrast waistband, and contrast side panels. Browse the entire collection for other mix-and-match pieces! Perfect Balance Girls Gymnastics Patriotic Print Tank Bra Top G687C: Be an American dream with this shimmering patriotic print by Perfect Balance. Bra top features tank straps, a colorblock pattern of blue, silver, and red, and a classic racerback. Complete your look with the matching patriotic shorts or leggings! Perfect Balance Womens Gymnastics Patriotic Print Tank Bra Top G687: Be an American dream with this shimmering patriotic print by Perfect Balance. Bra top features tank straps, a colorblock pattern of blue, silver, and red, and a classic racerback. Complete your look with the matching patriotic shorts or leggings! Perfect Balance Girls Gymnastics Diagonal Patriotic Print Tank Leotard G686C: Be an American dream with this shimmering patriotic print by Perfect Balance. This stunning leotard features tank straps, a three-tone, diagonal striped front print, and a two-tone back. Browse the entire collection for other mix-and-match pieces! Perfect Balance Womens Gymnastics Diagonal Patriotic Print Tank Leotard G686: Be an American dream with this shimmering patriotic print by Perfect Balance. This stunning leotard features tank straps, a three-tone, diagonal striped front print, and a two-tone back. Browse the entire collection for other mix-and-match pieces! Perfect Balance Girls Gymnastics Fish Scale Print Long Sleeve Leotard G691C: Get those fins ready to dive into this shimmering fish scale print collection by Perfect Balance! An adorable fish scale print crowns this ready-to-go leotard - featuring long sleeves, a metallic waistband, and metallic criss cross back straps. 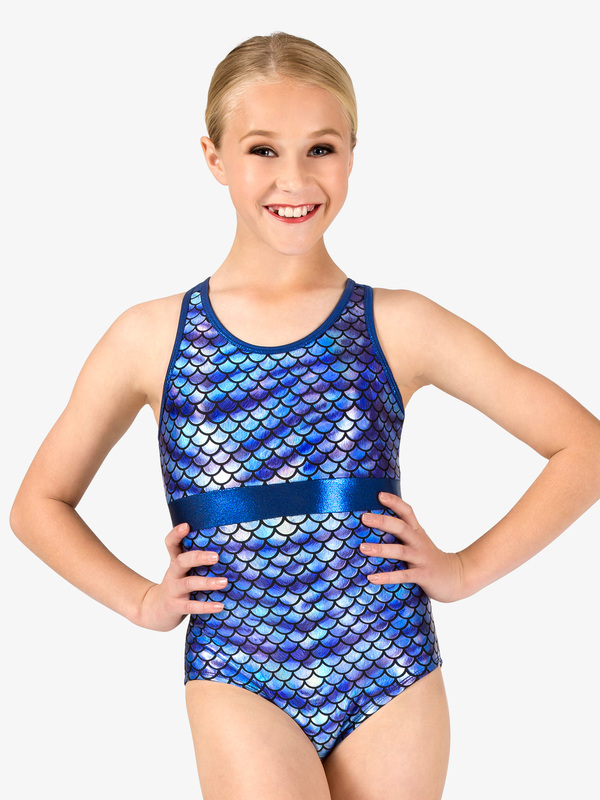 Perfect Balance Girls Gymnastics Fish Scale Print Tank Bra Top G693C: Get those fins ready to dive into this shimmering fish scale print collection by Perfect Balance! Attention-grabbing top features metallic tank straps, a subtle side metallic seaming, an x-back, a triangle-shaped keyhole, and a metallic band. Pair with the matching shorts for a complete look! 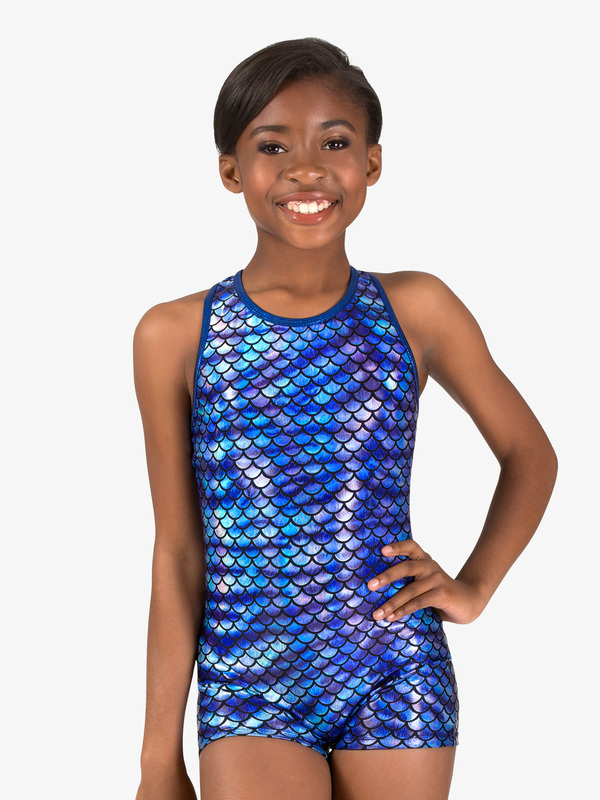 Perfect Balance Girls Gymnastics Fish Scale Print X-Back Leotard G692C: Get those fins ready to dive into this shimmering fish scale print collection by Perfect Balance! Leotard features tank straps, a metallic waistband, and metallic crisscross back straps. 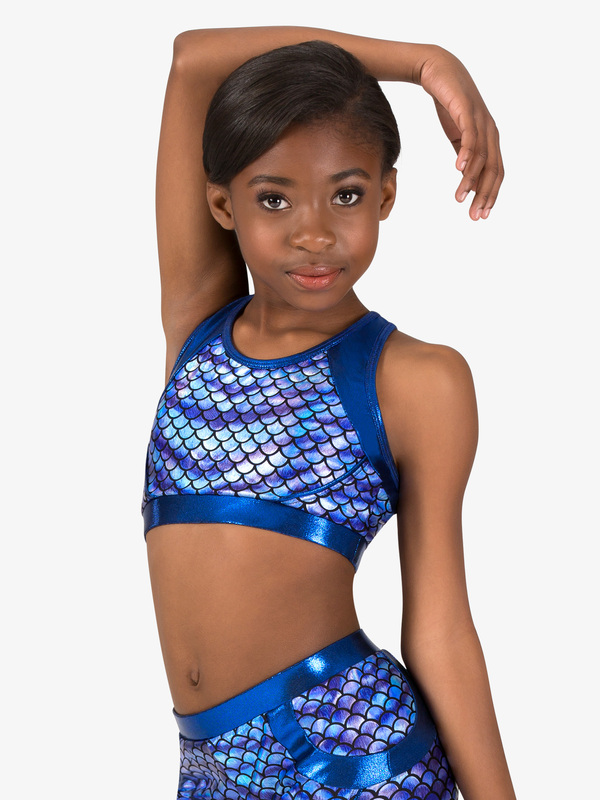 Perfect Balance Girls Gymnastics Fish Scale Print Shorts G694C: Get those fins ready to dive into this shimmering fish scale print collection by Perfect Balance! These fun gymnastics shorts feature a metallic waistband, and curved side metallic inserts. Pair with the matching bra top for a complete look! 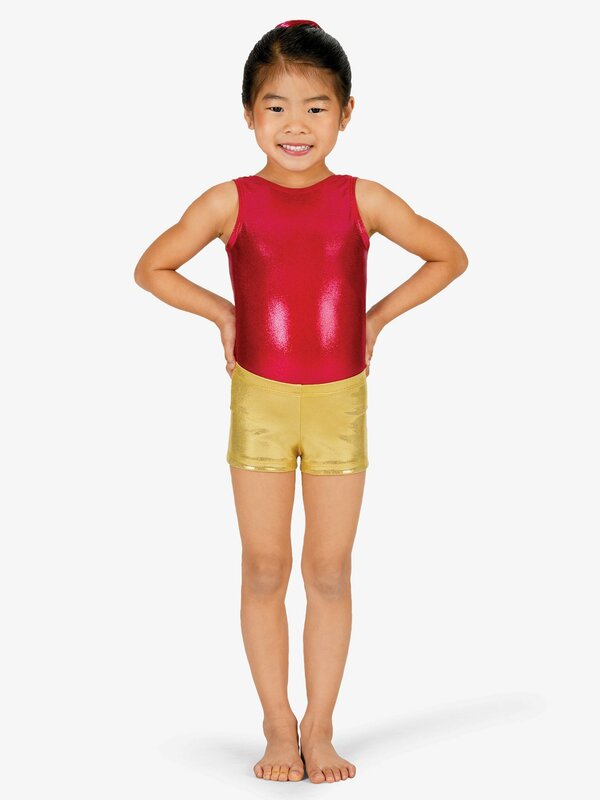 Perfect Balance Child Basic Metallic Dance Shorts G502C: Mix and match these solid color Metallic/Spandex shorts to your favorite solid or printed leotard. Fit for dance or gymnastics, the options are endless! Perfect Balance Girls Gymnastics Spliced Print Long Sleeve Leotard G677C: Quality, eye-catching designs at a price nobody can beat - take your balancing skills to the next level with Perfect Balance gymnastics wear! Leotard features a contrast trim, long sleeves, and a front side swooping, contrast-colored pattern. Perfect Balance Womens Gymnastics Spliced Print Long Sleeve Leotard G677: Quality, eye-catching designs at a price nobody can beat - take your balancing skills to the next level with Perfect Balance gymnastics wear! Leotard features a contrast trim, long sleeves, and a front side swooping, contrast-colored pattern. Perfect Balance Girls Gymnastics Spliced Colorblock Long Sleeve Leotard G676C: Quality, eye-catching designs at a price nobody can beat - take your balancing skills to the next level with Perfect Balance gymnastics wear! Round-off for this stunning leotard - featuring a metallic contrast neckline trim, long sleeves, and a contrast, curved front side pattern. Perfect Balance Womens Gymnastics Spliced Colorblock Long Sleeve Leotard G676: Quality, eye-catching designs at a price nobody can beat - take your balancing skills to the next level with Perfect Balance gymnastics wear! Round-off for this stunning leotard - featuring a metallic contrast neckline trim, long sleeves, and a contrast, curved front side pattern. 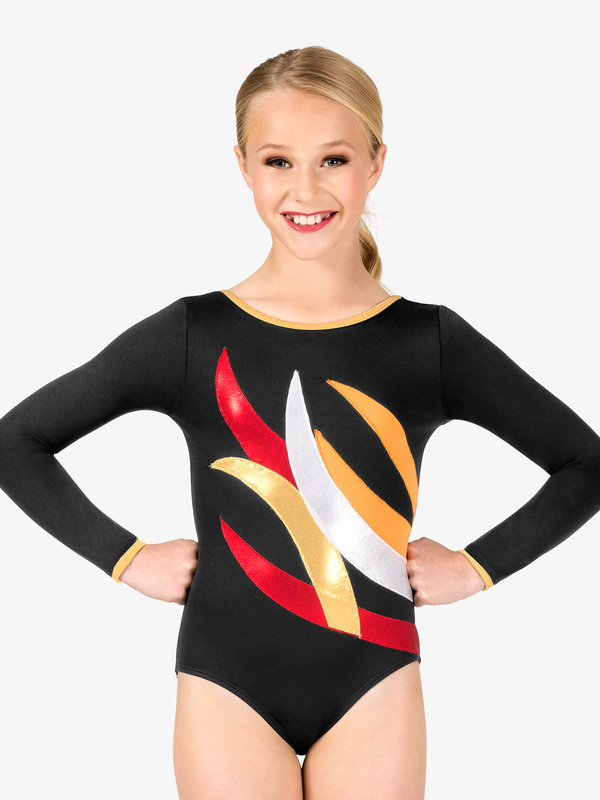 Perfect Balance Girls Gymnastics Contrast Spliced Long Sleeve Leotard G675C: Quality, eye-catching designs at a price nobody can beat - take your balancing skills to the next level with Perfect Balance gymnastics wear! This leotard features long sleeves, a contrast trim, and a colorful, curved side front print. Perfect Balance Womens Gymnastics Contrast Spliced Long Sleeve Leotard G675: Quality, eye-catching designs at a price nobody can beat - take your balancing skills to the next level with Perfect Balance gymnastics wear! This leotard features long sleeves, a contrast trim, and a colorful, curved side front print. Perfect Balance Child Basic Tank Leotard G500C: Shine everyday in this versatile, basic high-neck Metallic/Spandex tank leotard that comes in a wide array of solid colors. Perfect for practice or competition, dance or gymnastics! Each leotard comes with a matching scrunchie. Perfect Balance Adult Basic Tank Leotard G500: Shine everyday in this versatile, basic high-neck Metallic/Spandex tank leotard that comes in a wide array of solid colors. Perfect for practice or competition, gymnastics or dance, each leotard comes with a matching scrunchie. Perfect Balance Child Long Sleeve Metallic Leotard G545C: Shine like a star in this classic metallic long sleeve leotard featuring a high scoop neckline and moderate cut leg line. The perfect stand-out leotard for dance or gymnastics. Matching metallic scrunchie is included! Perfect Balance Child Basic Metallic Camisole Leotard G501C: Show off your skills in this basic Metallic/Spandex camisole leotard that comes in a wide array of solid colors to choose from. A glistening addition to your dance or gymnastic wardrobe. Each leotard comes with a matching scrunchie. Perfect Balance Child Basic Velvet Tank Leotard G505C: This soft, stretch velvet tank biketard will add a touch of elegance to your practice, performance, dance, or gymnastics. Comes with a matching scrunchie. Perfect Balance Girls Jungle Mania Gymnastics Tank Leotard G619C: This tank leotard is wild! Features a colorful rainbow Jungle Mania-inch animal print, a high neckline and a scoop back. Leotard is not lined. Great for practice! More Perfect Balance styles at Discount Dance Supply.